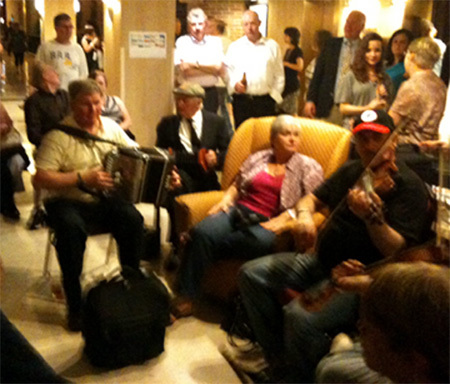 How It’s New York: The Mid-Atlantic Fleadh, which covers all of the east coast, the Maritimes, and Eastern Canada, takes place in Parsippany, NJ, and brings out many players from the Tri-State of all ages. How It’s Irish: The Fleadh, of course, is the regional competition of Comhaltas Ceoltóirí Éireann North America. The Fleadh Cheoil is a festival of Irish traditional music, dance, song and language, and at its heart is a competition. Stay tuned for comments from participants and more photos, and in the meantime, congratulations to New York’s Dylan Foley, who won the senior division in Fiddle, and to New Jersey’s Andy Lamy, who came in second in miscellaneous (Andy plays clarinet with the NJ Symphony Orchestra)! Both will be competing in the All-Ireland in Cavan in August. More results are posted here. 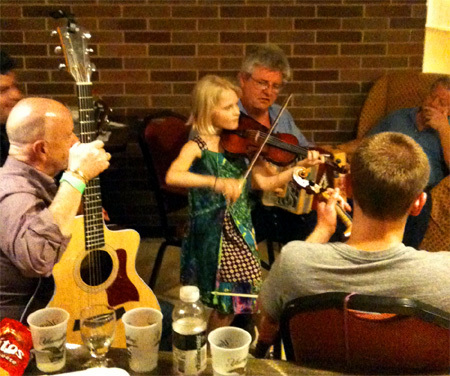 And have a look at Dan Neely’s post on the regional fleadh, after the Comhaltas Ceoltóirí Éireann Provincial meeting in St. Louis, Mo. 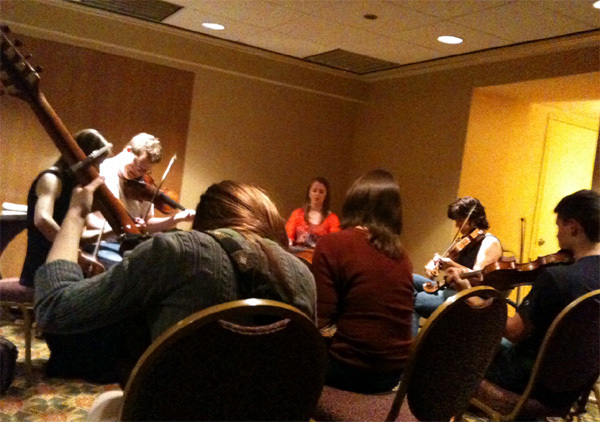 The 2012 Mid-Atlantic Fleadh took place last month at the Hilton Hotel in Parsippany, NJ, drawing a couple hundred youthful competitors and another hundred or so non-competing musicians sparking up a rolling series of impromptu sessions in hallways, lobbies and meeting rooms. At its vibrant best, a local fleadh is a celebration of Irish Traditional Music (ITM) and the resiliency of musical heritage in this tweeting-skyping-LOLing world. A fleadh is pure, free-flowing, all-ages craic made by real people in real time. Essential ingredients incude the tireless fleadh organizers and the judges and volunteers (including webmaster!) who administer and document the competitions. Then there are the teachers who labor throughout the year, year after year, guiding and nurturing their pupils not only in raw musical technique but in critical subtleties of style. Don’t forget the parents who support their talented progeny by purchasing instruments, transporting to lessons, encouraging home practice. Mix in the general audience of ITM music aficionados, including the veteran musicians who drop by, particularly players in their 70s and 80s whose presence provides continuity with the tradition’s centuries-deep roots. But the most important element of a successful fleadh is often overlooked. It is the competitors themselves. And while watching the young ceoltóirí go through their paces at Parsippany last weekend, the question presented itself: how many will be dropping by for tunes at the 2042 Mid-Atlantic Fleadh? When they “age out” of the tight framework of classes and competitions and recitals, what’s going to keep them actively involved in this music? If you’re an adult musician reading this, ponder a moment why you play Irish Traditional Music. Because you can play it, of course – you find it interesting, a good fit for your musical abilities, you enjoy the community of fellow musicians. Probably you don’t play it to become rich and/or famous or even more than slightly popular. Nor do you play to satisfy a sense of national identity; maybe one of your family elders played, but filial loyalty isn’t what keeps you perpetually searching for yet another killer variation of your favorite phrase of your favorite tune. Mostly you play because there are times when you hear this music that something you can’t explain stirs inside your mind and pulls you out of the conscious moment like an endorphin riptide flooding your senses with wave after wave after wave of melody and lift and nyah. You play it because it calls up a part of you that’s nearly impossible to locate in the workaday world of your normal existence, but it’s a part you don’t want to ever see disappear, and this simple yet endlessly nuanced music keeps it within reach, tethered by gossamer wisps of diddley-di-ay floating across your aching synapses. You play because, for you, Irish Traditional Music represents Passion. Authenticity. Connection. But what about the young players of today expertly tutored in ITM from an early age? They’re tightly connected to the beating heart of modern ITM here and in Ireland, and they don’t question whether the music is authentic or valid … they belong to a generation of American Irish musicians to whom playing Irish Traditional Music is as natural a part of social life as texting and energy drinks. As they move into adulthood, some will certainly venture beyond the basic ITM boundaries … they’ll innovate, experiment, cross-cultivate with other musics because present-day ITM has evolved to accommodate a wider degree of new musical input from savvy young players just like them. And when it’s their turn to pass on the music to those coming up, they’ll hopefully be ready and willing, be it as public performers and recording artists, teachers, parents or fleadh organizers. Or maybe even just showing up as part of the fleadh crowd to cheer on the younger versions of themselves. Which would be awesome, go cinnte.